The goal of our Master Marketing: New Luxury & Art de Vivre is to train marketing specialists for the luxury industry with both an excellent knowledge of the sociological and cultural aspects of luxury and a deep understanding of the issues of sustainability and responsibility. Both marketing professions and the luxury industry are changing and constantly innovating at a rapid pace. Digital technologies and new economic models have profoundly impacted customers behaviour, the customer's journey and their relationship with brands. The Luxury industry faces important challenges and opportunities amongst which the emergence of new generations and segments of customers, new conceptions of consumption and luxury as well as ever changing digital usages. CSR and more specifically sustainability are issues of particular importance to the sector and need to be integrated into business models to meet the ethical standards of all stakeholders and to guarantee the future sourcing of excellent raw materials. 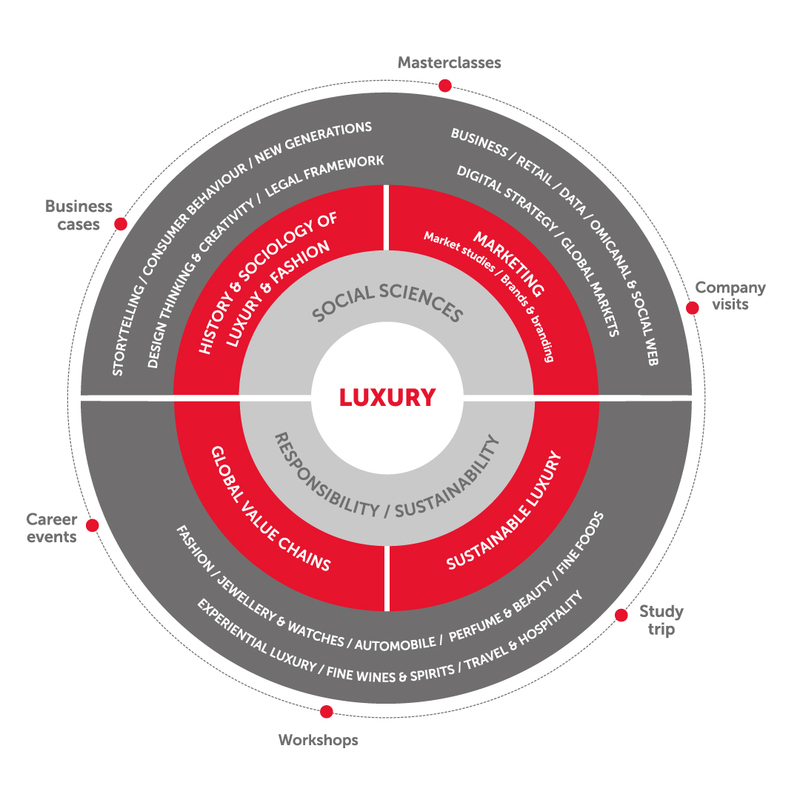 These developments require new skills and our program provides students with the knowledge and the tools to contribute to the future of luxury by developing their analytical and critical skills in the strategic issues faced by companies in the global, complex and changing business environment of the luxury industry. The first semester is dedicated to the acquisition of the fundamentals in Marketing and a first approach to luxury with a progressive specialisation in semesters two and three. Courses are taught by faculty calling upon their expertise in the social sciences and by lecturers who are leading specialists from the luxury industry. Compulsory fundamentals taught during the second semester include courses on sustainable luxury, luxury markets and consumers around the world, digital strategies of luxury brands and legal aspects of marketing etc. The third semester allows students to specialize by choosing from a variety of classes on different luxury goods and services while perfecting their marketing skills. Throughout their studies students participate in workshops to acquire practical professional skills and practice their creativity. Partnerships with other prestigious Parisian schools such as Parsons Paris add to the variety of the curriculum. The final semester is devoted to a compulsory internship in France or abroad. Close to 60% of our graduates from the French track of the Master Marketing are employed before graduation and 80% after six month.